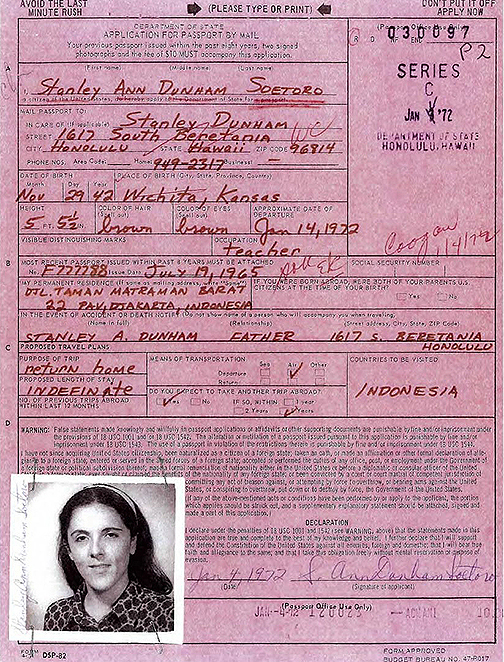 President Obama's mother, Stanley Ann Dunham, worked in Indonesia for a U.S. Agency for International Development (USAID) embassy cover operation that helped identify some 5000 key members of the Indonesian Communist Party -- Partai Komunis Indonesia (PKI) that were targeted for assassination by Indonesian armed forces units, of which her husband and President Obama's step-father, Lolo Soetoro, was a participant. The 5000 targets' names appeared in what was called by the CIA "the shooting list." 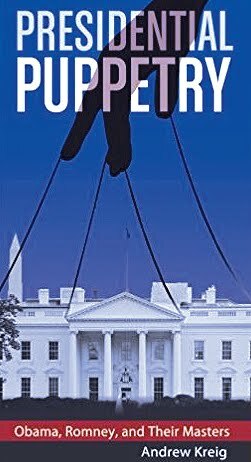 Dunham Soetoro began working for CIA/USAID front, Lembaga Persahabatan Indonesia Amerika (LIA)–the Indonesia-America Friendship Institute. 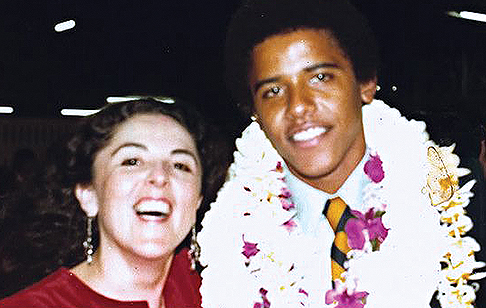 In 1972, Dunham Soetoro returned to Hawaii to continue her CIA work in Indonesia under the non-official cover of two agency fronts, the Asia Foundation and the East-West Center at the University of Hawaii. 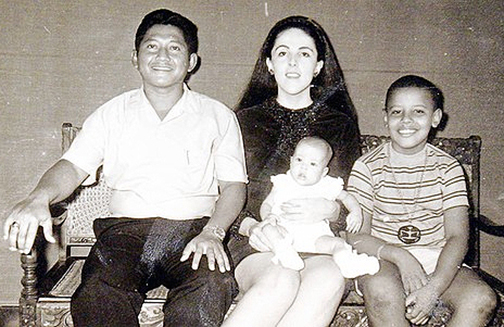 Dunham Soetoro returned to Indonesia in 1975 to conduct "anthropological field work." 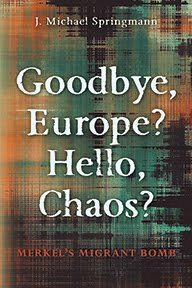 The year 1975 is key since it was the year East Timor gained independence from Portugal and when the CIA, working with Suharto, planned the Indonesian invasion and bloody occupation of East Timor, a move that had been given the green light by then-Secretary of State Henry Kissinger. Kissinger now serves as a foreign policy adviser to President Obama. On December 7, 2010, WMR reported on the details of Dunham Soetoro's "anthropological field work." CIA files contain a 1967 letter to the editor of the Daily Emerald from three anthropology professors at the University of Oregon supporting a decision of the American Anthropological Association (AAA) condemning the "intelligence meddling" of the CIA and Defense Department in anthropological field work. 1967 was the same year that Ann Dunham was performing such anthropological "field work" for USAID, a front for the CIA, in Java, Indonesia. The AAA's Professor Ralph Beals [from UCLA] report stated that the Pentagon and CIA "repeatedly interfered with anthropological work abroad, and have clearly jeopardized our chances, as anthropologists, to do meaningful foreign research." 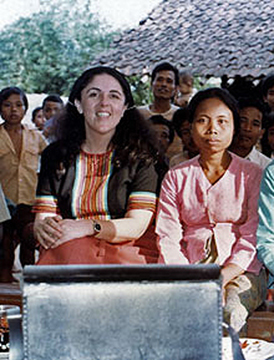 And in what is the clearest evidence yet that Ann Dunham was working for the CIA in Indonesia and elsewhere, the Beals Report stated: "several anthropologists, especially younger ones who had difficulty in securing research funds, were approached by 'obscure' foundations or were offered support from such organizations only to discover later that they were expected to provide intelligence information to the CIA." The report added, "agents of the CIA have posed as anthropologists, much to the detriment of the anthropological research programs." 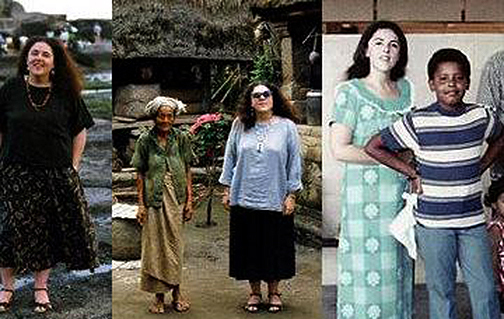 In Ann Dunham/Soetoro's case, her foundation "sugar daddy" was the Ford Foundation and USAID. Her boss at Ford was none other than Peter Geithner, the father of President Obama's current Treasury Secretary, Tim Geithner. The Ford Foundation, on behalf of the CIA, began currying favor with top Indonesian military officers as early as 1954. Ford's chief liaison to the officers, as well as to members of the Indonesian Socialist Party, was Ford researcher Guy Parker. 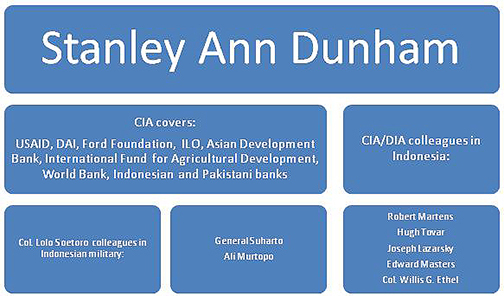 The CIA's involvement with village politics in Indonesia, began when the Ford Foundation started the Modern Indonesia Project, a CIA cover program during the Sukarno regime that was run out of Cornell University, University of California at Berkeley, and MIT, an academic cover operation into which Dunham Soetoro was later placed. Ford Foundation-funded scholarships were used to provide education to a number of Indonesian military officers and economists who would become leaders in Suharto's government. 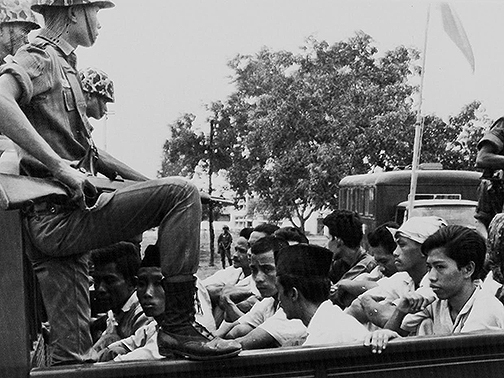 After Suharto's "New Order" government came to power, key Indonesian assets of the CIA were placed into top positions in Indonesia's mining, oil, and timber industries. One was Lolo Soetoro who went to work for Exxon. Dunham Soetoro's USAID/CIA cover in Indonesia's Java continued from 1975 to the end of 1980 continued through the auspices of various employers, including BAPPENAS (Badan Perencanaan Pembangunan Nasional) -- the Indonesian National Development Planning Agency, the UN's International Labor Organization, the Ministry of Industry Provincial Development Program (PDP I), and most significantly, the notorious USAID/CIA cover company, Development Alternatives, Inc. (DAI) of Bethesda, Maryland. The Obama administration is currently demanding that Cuba release Alan P. Gross, a DAI employee charged with espionage under the cover of providing telecommunication support for the Cuban Jewish community. Leaders of Cuba's Jewish community have stated they are not familiar with Gross. DAI has also been involved in funneling National Endowment for Democracy (NED) funds on behalf of the CIA to the Venezuelan opposition to President Hugo Chavez and covert funding for Iraqi groups during the U.S. Coalition Provisional Authority regime of U.S. viceroy for Iraq Paul "Jerry" Bremer, a Henry Kissinger understudy. Like Business International Corporation (BIC), the company that employed Barack Obama after his graduation from Columbia University in 1983, DAI, which employed Obama's mother from 1978 to 1980, has been a long-time CIA front. Dunham Soetoro worked for DAI during the time period that Barack Obama was attending a favorite CIA recruitment college, Occidental College of Los Angeles. 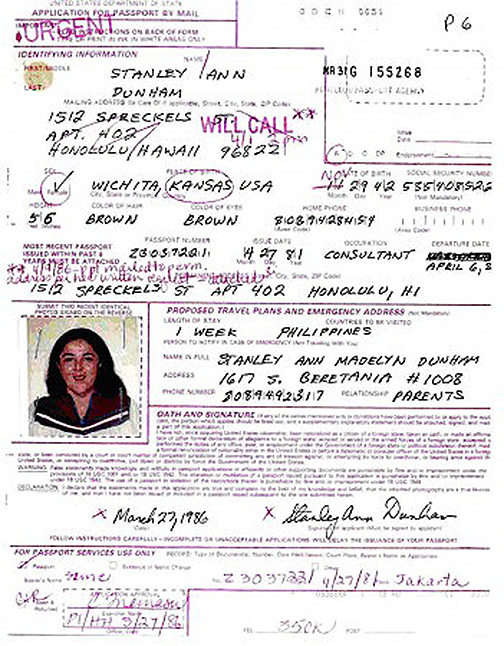 While Barack Obama was at Columbia and CIA front BIC, his mother was under non-official CIA cover from 1981 to 1984 in Jakarta as the program officer for women and employment for the Ford Foundation's Southeast Asia regional office, a job that took Dunham Soetoro to other nations in the region, including the Philippines, Thailand, and Malaysia. Dunham Soetoro's cover story was a Ford Foundation micro-financing project. Fluent Russian speaker, Robert J. Martens was a member of the political section [CIA station] of the U.S. embassy in Jakarta from 1963 and in the years leading up to the Suharto coup. Masters was number three in the embassy's chain-of-command. 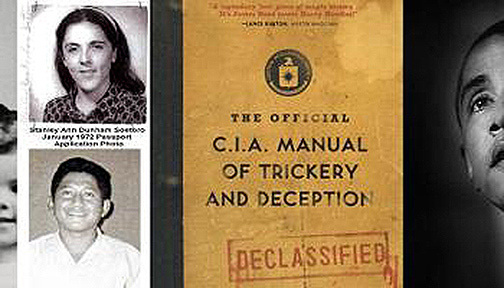 In the years during which the Indonesian communists and their sympathizer were tracked down and murdered, Martens would have been within Dunham Soetoro's USAID CIA cover chain-of-command after she arrived in Jakarta in 1967 for the CIA's mopping up operations in the Indonesian rural villages. Martens, who previously served in Naples, Vienna, Salzburg, Oberammergau, and Moscow, before being posted to Jakarta, was considered one of the CIA's top operatives in Jakarta and he helped craft the CIA's "shooting list." 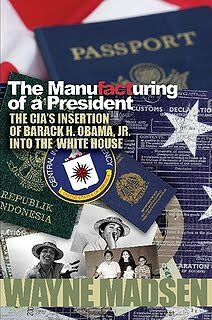 Others in Dunham Soetoro's CIA chain in Jakarta were CIA station chief Bernardo Hugh Tovar, CIA deputy station chief Joseph Lazarsky and Jakarta embassy political section chief Edward Masters. Tovar, a native of Colombia, had been assigned previously to the CIA stations in Kuala Lumpur and Manila. Masters, who was fluent in Hindi, had been posted in Frankfurt, Karachi, and Madras before being assigned to Jakarta to help plan the CIA coup against Sukarno. Dunham Soetoro was assigned to Java villages to conduct "anthropological" research since the CIA had identified Indonesian village cadres, including members of the Gerwani women's organization and SOBSI labor federation, as primary supporters of the PKI and Sukarno. 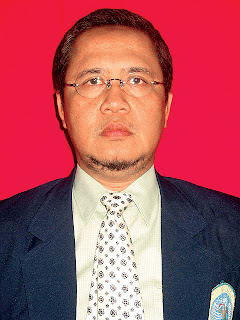 With his CIA connections, Lolo Soetoro's dual chain-of-command, in addition to his reporting to Suharto and his top men, would have also included the U.S. embassy's defense attache, U.S. Army Colonel Willis G. Ethel. Colonel Ethel worked closely with Indonesian intelligence chief Ali Murtopo. The CIA officials in Indonesia reported to William Colby, the director of the CIA's Far East Division. Colby was the brains behind another CIA assassination program, the Phoenix Program in South Vietnam. 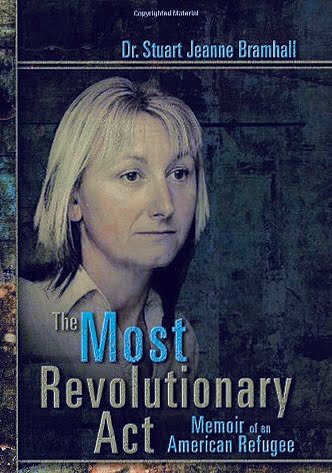 From 1989 to 1990, reporter Kathy Kadane conducted a series of interviews with former CIA personnel who were involved in the 1965 coup and the subsequent mass killings of Communists. Martens revealed the role of the CIA "shooting list" for Suharto's army, in which Lolo Soetoro served, in the systematic assassination of PKI members: "It was really a big help to the army . . . they probably killed a lot of people. and I probably have a lot of blood on my hands, but that's not all bad. There's a time when you have to strike hard at a decisive moment." Asked whether the CIA sent Martens to Indonesia in 1963 to compile kill lists, Colby responded, "Maybe. I don't know. Maybe we did. I've forgotten." In order to communicate the names of suspected Communists from outlying villages like those where Dunham Soetoro worked, the CIA provided Indonesian military officers and CIA agents with Collins KWM-2 radios, requisitioned from U.S. Air Force stocks at Clark Air Force Base in the Philippines and flown to Jakarta on U.S. Air Force C-130 transport planes. National Security Agency intercept stations in Southeast Asia also picked up the radio transmissions from the Indonesian army field officers and CIA overseers like Dunham Soetoro to ensure that all suspected PKI members were identified for elimination by matching the "field" human intelligence with other NSA information compiled from intercepts of Indonesian commercial and government communications, i.e., signals intelligence or "SIGINT." Others at the embassy who directed CIA operations against the PKI included U.S. ambassador Marshall Green and deputy chief of mission Jack Lydman. 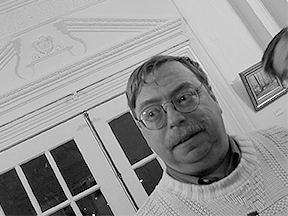 Green dropped dead from a heart attack on a Washington, DC golf course in 1998. He worked for Nixon national security adviser Kissinger after leaving Indonesia in 1969. Lydman later was involved in the State Department's review of Indonesian military operations in West New Guinea in 1969, after the Indonesian annexation of the former Dutch territory. 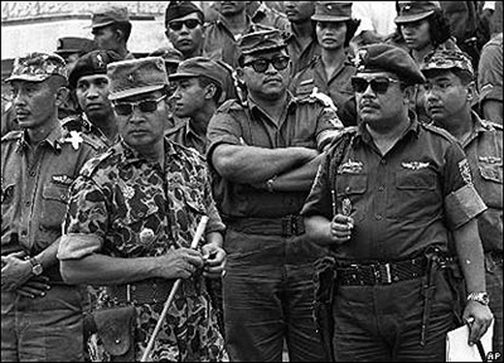 Colonel Lolo Soetoro was involved in the bloody Indonesian army crackdown on West Papuan secessionists in the territory. On March 11, 1966, while Lolo Soetoro continued to assist Suharto in the identification and rounding up of PKI members for execution, the U.S. embassy in Jakarta sent a airgram A-654 to Washington. The airgram was drafted by Martens and signed by Masters. The airgram stated it was necessary to compile a new list of PKI members because information on PKI officials "remains extremely fragmentary but sufficient additional information has been received to make a new compilation advisable." The airgram contained a list of 80 PKI leaders and their status. 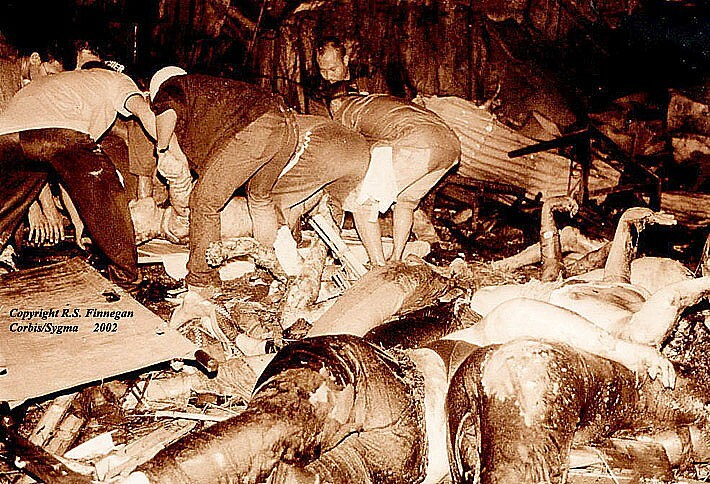 The Indonesian army's and CIA's kill list would not end with the elimination of PKI members and their sympathizers. 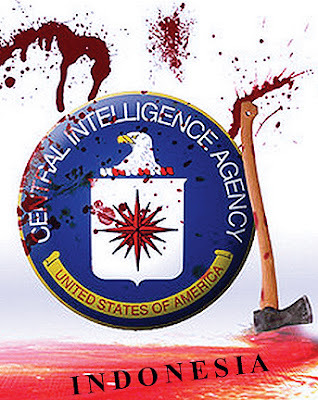 Kill lists would play out in West Papua, East Timor, and Aceh province during the time of Obama's "Mommy Dearest's" bloody work in Indonesia on behalf of her bosses at the CIA, USAID, and Ford Foundation. The problem for Barack Obama is not shouldering blame for sins of his mother and step-father but the fact that he has lied completely about their history. In his book, "The Audacity of Hope," Obama writes about his mother's first trip to Indonesia in 1967: "In later years my mother would insist that had she known what had transpired in the preceding months, we never would have made the trip. But she didn't know -- the full story of the coup and the purge was slow to appear in American newspapers. Indonesians didn't talk about it either." If they were truly Ann Dunham Soetoro's words, we can be certain of one thing: she trained her son to lie just as well as she did.